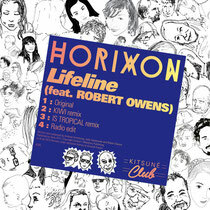 London producers Andrew Armstrong and John Sambrooke aka Horixon are set to release their very first single on Kitsuné with house legend Robert Owens. Andrew Armstrong on the one hand is the producer half of the band Monarchy, and under that name has DJ’d across the world, remixed the likes of OMD, Jamiroquai, S'Xpress, Kelis, Kylie and many more, as well as playing live at festivals such as Coachella, Bestival, LoveBox, Melt, and headline shows. John Sambrooke on the other hand is more of a background producer/engineer in London, working behind the scenes assisting on a number of projects. The two of them started Horixon on a whim, deciding to spend Wednesday afternoons in the studio making something a bit clubby. The first track they did together needed a vocal, so they asked Robert Owens to do the honours. The fit was perfect, updating his delivery to something modern, as well as keeping it classic and referencing strongly the sound of early house. ‘Lifeline’ was born.For this debut, the band is joined by two remixers: south London based producer Kiwi and Kitsuné’s protégés Is Tropical. In addition to the release, ‘Lifeline’ is also one of the standout tracks on the forthcoming ‘Kitsuné Maison 15 Compilation’. The single is out 4 November.